I really love being a mom… and probably equally as much, I love being your aunt!! It makes me so happy to watch you all play and learn and grow. This weekend, I got to see all eight of you and boy, it was so much fun!! You are all so different and that is fun to watch. You all love to play the things that are most exciting for you… and as I watched this weekend, I saw that you each play in your own special way. Some of you are bossy, some of you are not. Maybe you are quiet or silly or sweet or grumbly. One or two of you like to play one-on-one, where you are alone with an adult or just one cousin. Some others like to put on a show for everyone. I know that some of you are starting to notice that Tessa is a little different than everyone, too. She has some different things that she uses, like her leg braces or her walker. Sometimes she says a lot of words to you but you can’t understand what she says. Or she uses her hands for sign language. All of you are growing fast fast fast, even Tessa. It’s hard for her to walk or talk like you big kids, so I know you sometimes forget that she is not a baby. I love when she plays with you! I hope that when she sees you run, she’ll want to run too! She learns a lot by watching what you do. That doesn’t mean that you always have to be on your best behavior when you are around her (but you do have to be on your best behavior because your parents say so). If you have questions about the things that she does, you can always ask me or Uncle Johnny. What is most important is that you just keep playing with her like all the other kids. She is a tough little girl, just like the rest of you, and she just wants to do the things that you do… it just takes her a little longer to learn how. Ok, let me level with you here. We have actually had it in our home for quite some time. It largely sat unused for several weeks, a giant elephant in the corner, taunting us with it’s slick silver bars and fake leather arm support. Have I mentioned that I hate it? I hated her orthotics just as much at first, though now that hate has mellowed to a slow burning irritation. I struggle quite deeply with the fact that her disability is worn on her face. I know that there are equally as many drawbacks to having a disability that is not visible to any Joe Schmoe, but I wish that I knew that some people, some day, would pass her on the street and not just see Down syndrome. When there is equipment, well, it just draws attention to her challenges. In any case, we have the walker now and while I hate it, I have had to slowly come around because it is what she needs right now. So much of parenting is reminding myself that it’s not about me; it’s about my children and their lives and doing what is best for them to grow strong and independent. 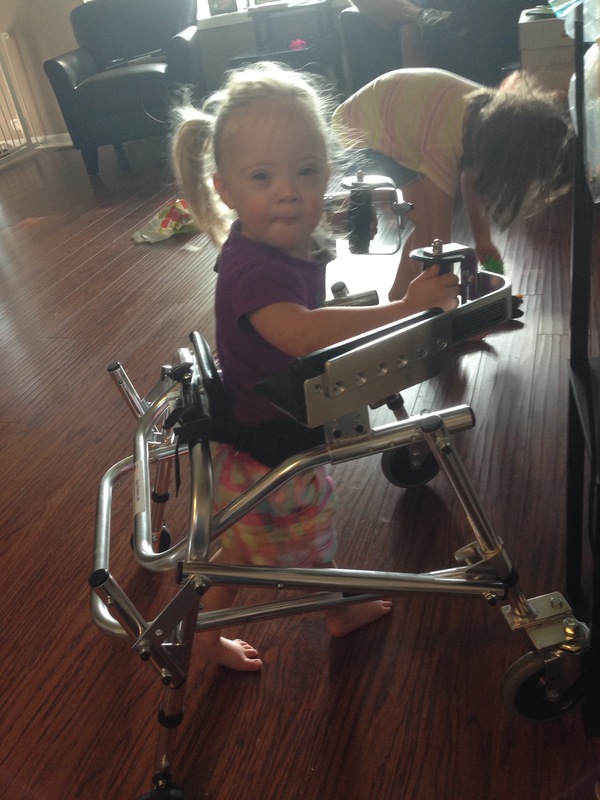 So while I may carry my own insecurities about people having pity on the girl with the walker, the more important cause is helping Tessa get up on her own two feet. How challenging it is to see our children fight their own battles!! 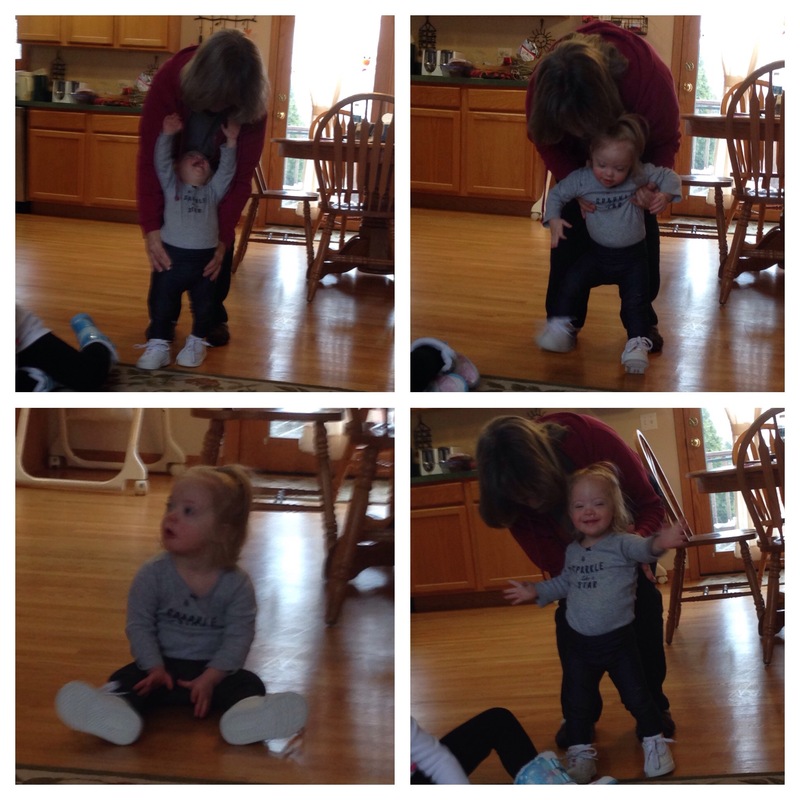 The milestone of the day for us (me, really) was that we took the walker out of the house for the first time. 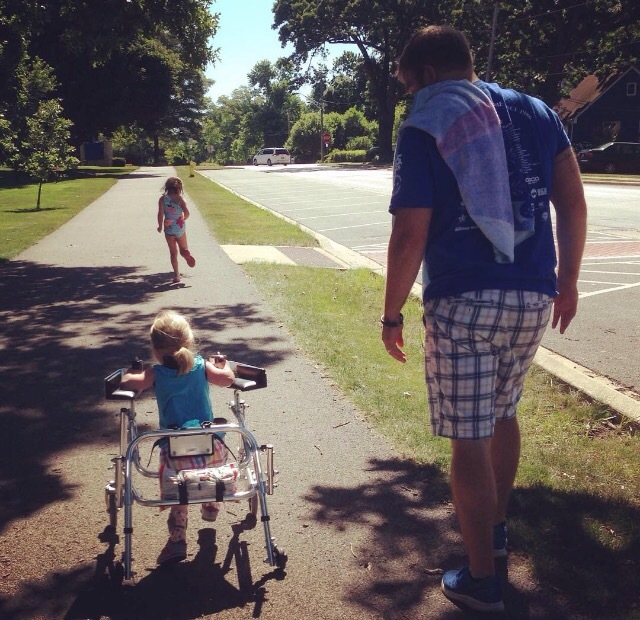 When Tessa’s therapists came, they suggested a session in the park a short walk from our house. So off they went, and Tessa, strapped into her little walker, just raced along the path, shuffling her little feet as fast as she could. She, the child who cried at the site of her walker just three weeks ago, went about a quarter mile – all the way to the park, actually. She made it. It’s not about me. It’s not about the people who gawk as they drive by us peddling on down the road. It’s about Tessa, and it’s about getting her wherever it is that she wants to go.